Welcome back to the Wednesday Weekly Challenge. Each Wednesday we will be posting a tatting related challenge (usually in the form of a free tatting pattern link) and challenging you, the reader, to try it. When a pattern link is provide, we will also post a picture of how our tatting turned out when we followed the pattern. Following the challenge, we will feature reader completions of past challenges. So submit your completed work whether it be from challenge #1, 29, or the current challenge. All submissions will be posted in the next week’s challenge. I don’t have a new pattern for you this week. As you could probably guess by my absence, life has been a little busy (sewer pipe collapse, death of my cat, gaining two new kitties, job changes,… busy). During all this time, I have been tatting – just been working on things from published patterns or creating things I need to write down. As such, your challenge for today isn’t a new pattern. This week’s challenge is for everyone to reflect and share about their tatting inspirations. Who or what inspires you to tat? Another tatter? A relative? A pattern? What has sparked the creativity for you in tatting? 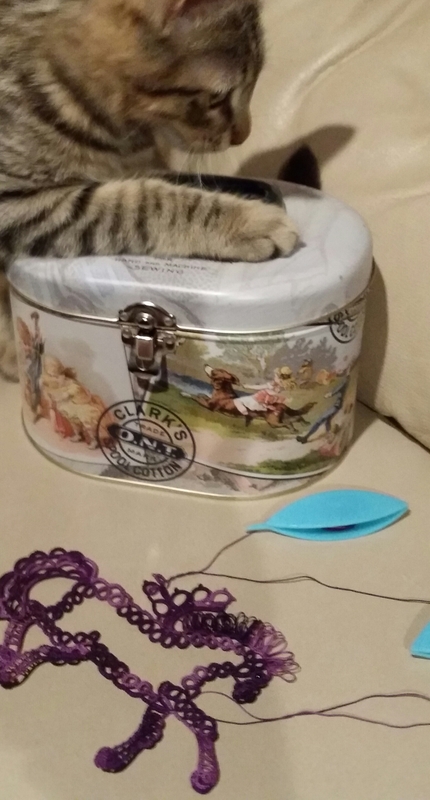 Has someone or something inspired you to tackle a tatting project that you might not have otherwise attempted? In progress shot of a pegasus from Martha Ess’ book, Flights of Fantasy (with slightly modified ear and tail) and my cat, Klaus. I have been inspired by my friend (and tatting mentor), Donna. She taught me to tat and opened my eyes to the wonderful beauty of miniature knots. Some of the first patterns I tackled came from Patti Duff’s Minitats: A Collection of 69 Petite Motifs book and she taught me something new about the magic thread trick at the free tatting class earlier today. 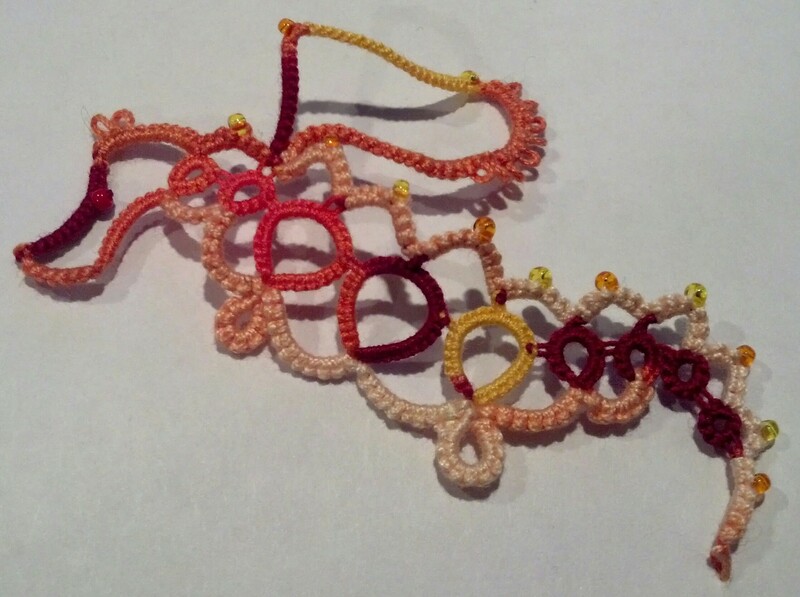 Anne B’s dragon pattern is what hooked me on tatting. Armed with just the very basics, I searched the internet for tatting patterns and her dragon was one of the first that I found. It sent me bugging my mentor about different techniques and spurred on my progress. I’m sure Donna heard the phrase, “Do I know enough to tat the dragon, yet?” more times than she needed to. 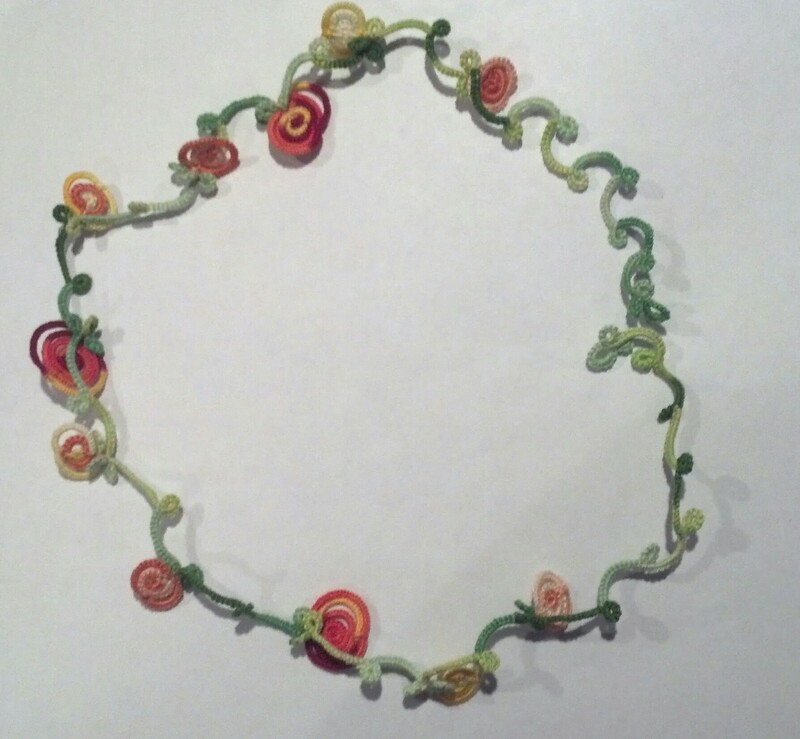 My co-blogger, Davina, is also a talented bead maker and her beads have inspired a few of my creations. The Shuttlebirds Tatting Guild has been a great source of inspiration for me as I have been amazed by the tatting these wonderful ladies can do. Every pattern author we have featured has inspired me and it has been a joy to tat their work. In addition to tatters, I have also been inspired by flowers, sea creatures, and DNA strands. You never really know where inspiration might strike next! In fact, I’m looking forward to being inspired by your responses and I hope you will be inspired by each other and the Spotlight Features over this next week! Shuttlebirds’ Reader Spotlight: This is where your tatting will be featured each week you contribute. 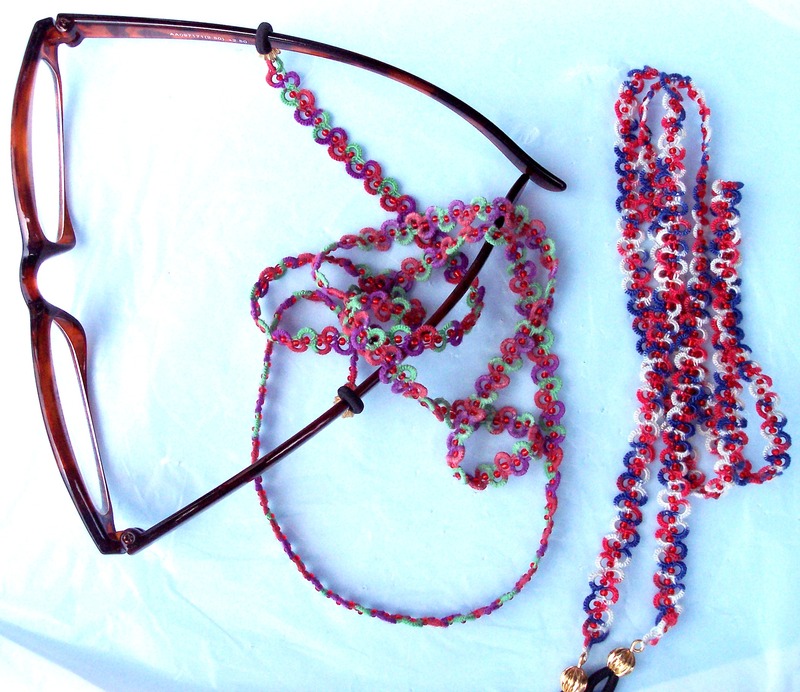 Challenge Accepted – Reader Submission for Weekly Challenge #40 – Patti’s Lanyard. Stephanie decided to use her lanyards as eye glass chains. She used Perfect Quilter #17-wt (color: volcano) for the pair attached to the glasses and Sulky #12-wt cotton ‘Blendables’ in a red/white/blue mix for Mom’s. Red seed beads, size 11, on both. I love seeing what everyone tats! Thanks for submitting! We look forward to seeing your creations! Welcome back to the Wednesday Weekly Challenge. Each Wednesday we will be posting a link to a free pattern and challenging you, the reader, to try it. 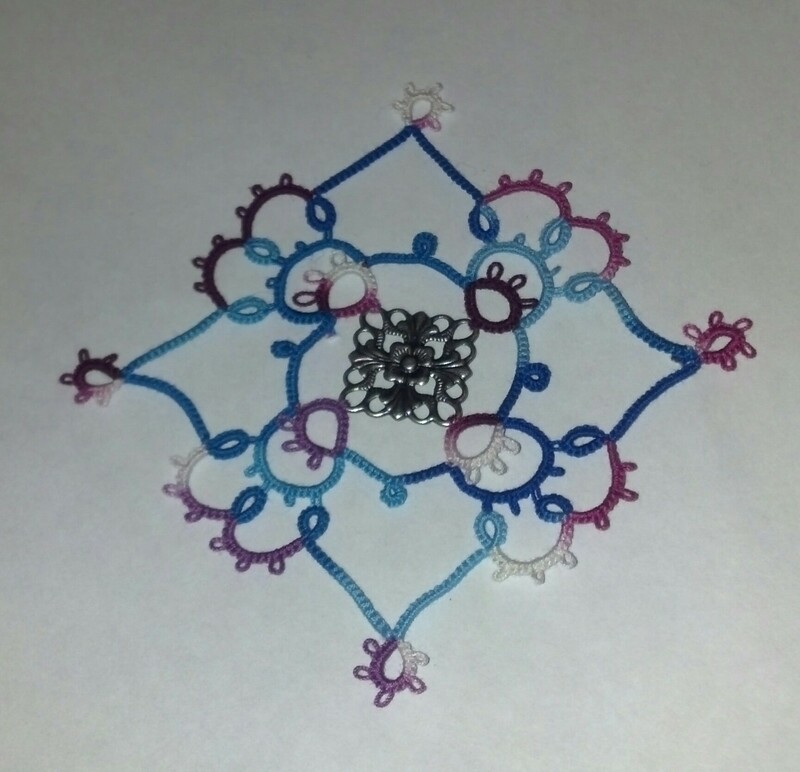 In addition to the pattern link, we will post a picture of how our tatting turned out when we followed the pattern. Following the challenge, we will feature reader completions of past challenges. This week’s pattern is by the talented Martha Ess! She has several wonderful patterns. You should check out all the places she is online (and her books!). I especially find her “Tatting Origins” blog to be an interesting read. I have been wanting to do this lovely design for quite a while. I’m glad I finally took the time. I hope you enjoy tatting it as much as I did. I love seeing what everyone tats! I do hope to see some of your creations this week! Paprika the Dragon – Pattern by Martha Ess – Tatted by Natalie Rogers. Such an adorable dragon! I love it! Challenge Accepted – Reader Submission for Weekly Challenge #23 – Pumpkin Earrings – Tatted by Terry. 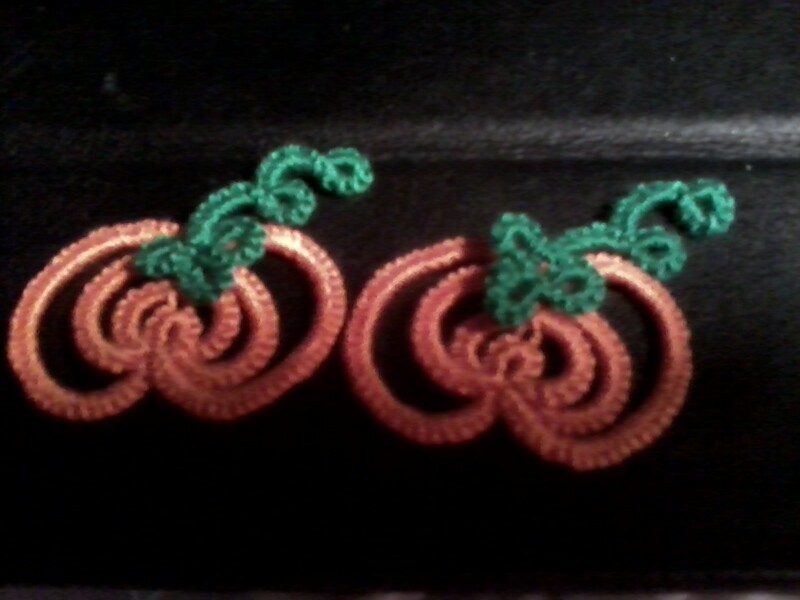 Challenge Accepted – Reader Submission for Weekly Challenge #24 – Pumpkin Patch Necklace – Tatted by Natalie Rogers.